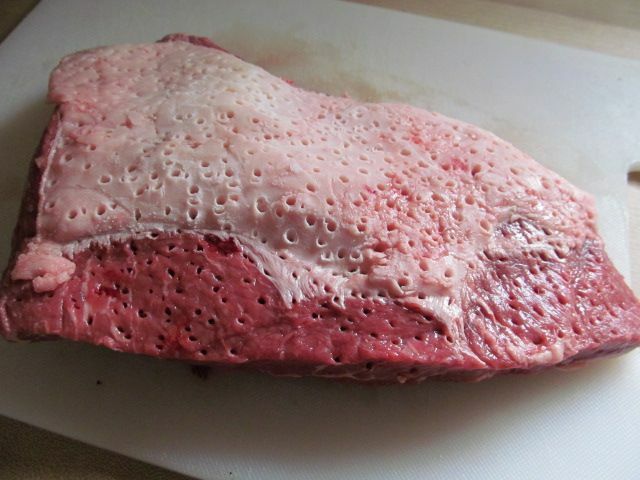 My butcher get in some of the best looking tri-tip roasts. We have also done well in any grilled beef competition serving our grilled tri-tip. So, a few weeks ago, we took the opportunity to practice our tri-tip cook. 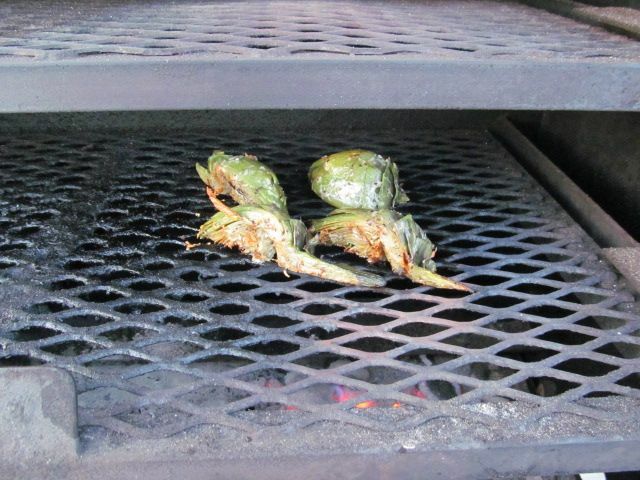 At the same time, our local grocery store had artichokes on sale, so I decided to try my hand a grilling a few. 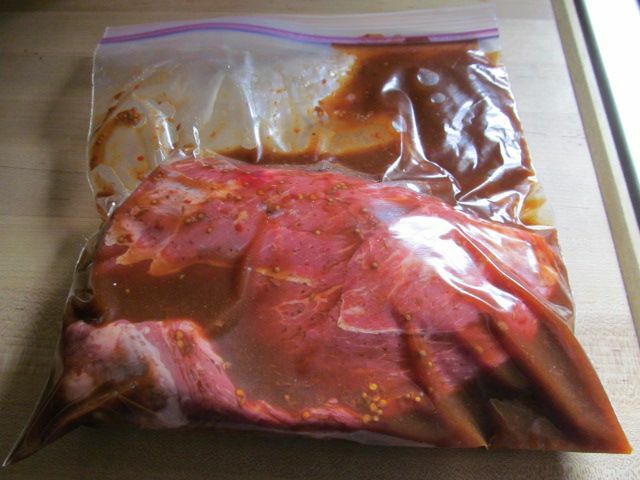 First, I took my tri-tip and tenderized on both sides, then I placed the meat in a plastic bag with a bottle of Stubbs beef marinade. I then placed everything in the refrigerator to get happy for a few hours. 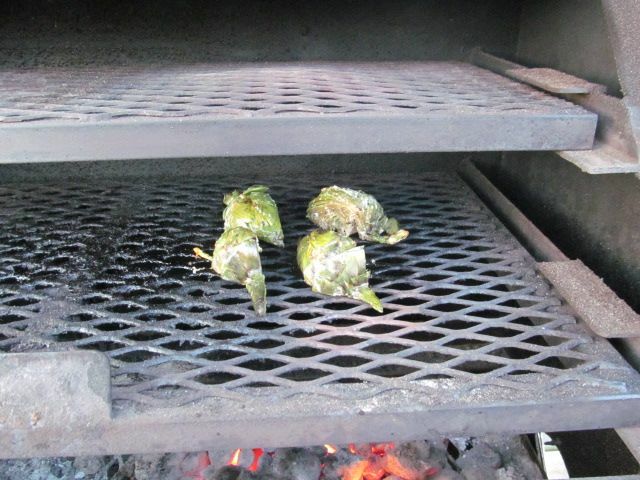 While the tri-tip was getting happy, I started on the artichokes. I started by cleaning them. First I removed the outer layer of leaves from the bottom and rinsed well. 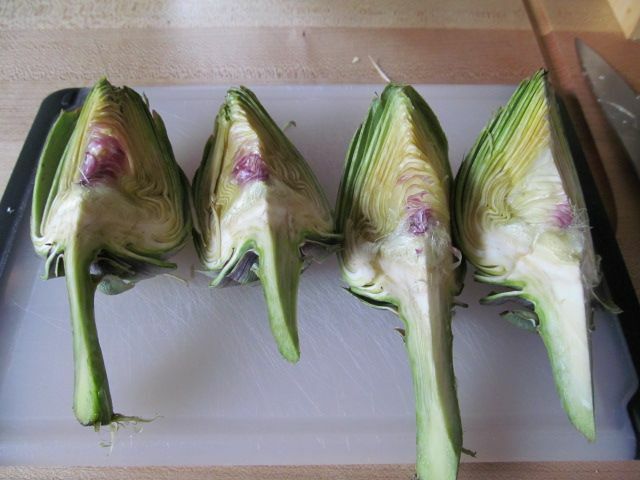 Then, I cut the artichoke into quarters, leaving the stem intact. I placed the artichokes in simmering water and let them simmer for 15 minutes. Then, I removed them from the water, and cleaned them further by removing the hairy part where the leaves meet the stem. The is the "choke" part, just above the heart. Once this was complete, we were ready to roll. I seasoned my tri-tip with some Oakridge Black Ops Rub and allowed the meat to come to room temperature by sitting out for an hour. 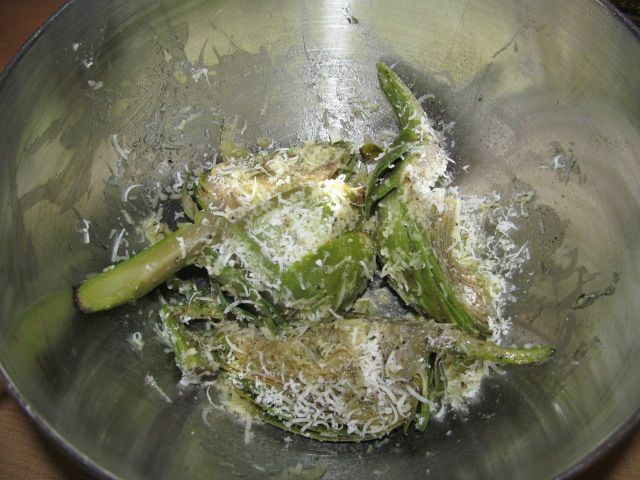 To the artichokes, I added olive oil, salt, pepper, and fresh ground Parmesan cheese. When you add the oil and cheese, be sure to work the mixture down into and under the leaves for maximum flavor distribution. I fired the grill up and made a nice bed of coals. I placed my tri-tip over the coals on direct heat and we were off to the races.. Once the tri-tip hit 135 F internal, I brought the meat inside to rest under some foil for 10 minutes and took the artichokes outside to grill. I placed the artichokes on direct heat for five minutes a side. You only want to grill them long enough to warm them up, put some grill marks on them, and to brown the Parmesan a little. When done, I brought them inside and sliced the tri-tip. 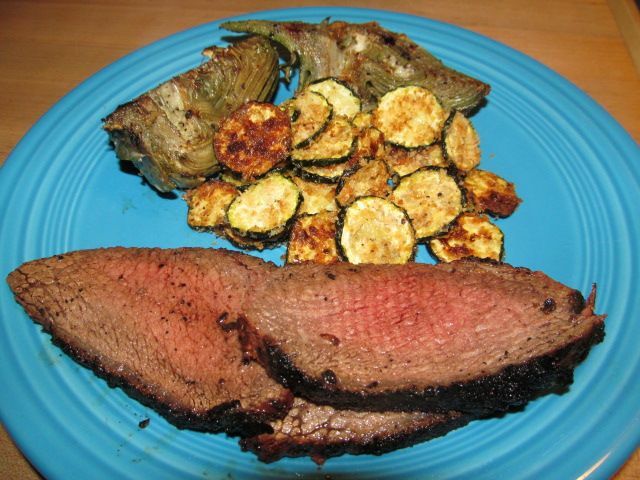 We served this tri-tip with the grilled artichokes and some oven roasted crispy Parmesan zucchini chips. Good stuff. Hope liked the artichokes, so we can have them again. The tri-tip was flavorful, juicy, and tender as always. The zucchini chips were good as well. We like these better than fried. Just a touch of olive oil, salt, pepper, panko bread crumbs and grated Parmesan. In the oven at 450 F for 20 minutes. They are sweet, crunchy, and not drenched in frying oil. They are actually good for you. Tri-tip and artichokes are two native California ingredients. Both are no strangers to our household. Grilled artichokes are very tasty and nice because you have done all the work of cleaning during prep. 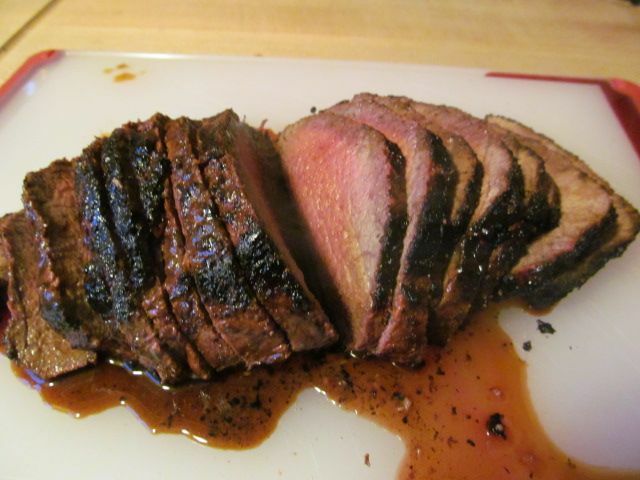 We love tri-tip and have been judging them in the smaller contests. (Usually non KCBS). I am surprised and shocked about the different ways people have presented their entries. 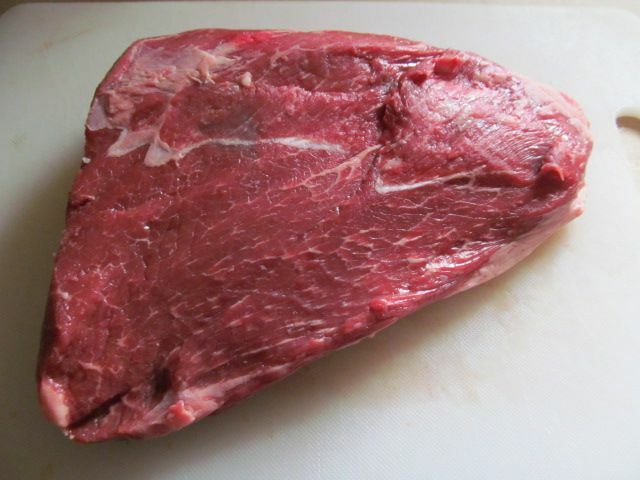 Tri-tip needs a very short cooking time compared to the big meats. What fun. 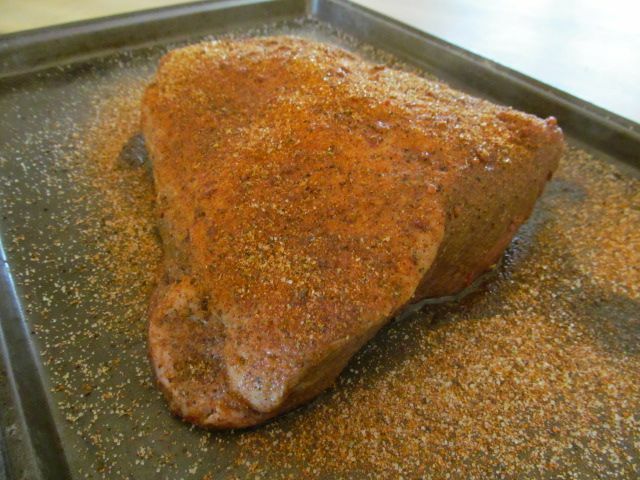 Chilebrown, we just love tri tip. 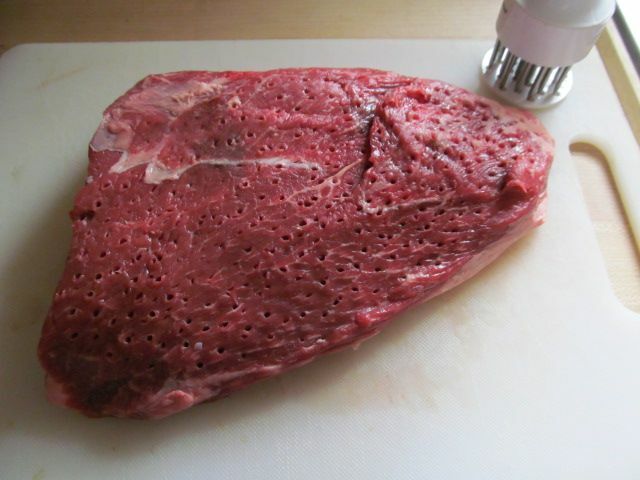 We think it is better than any other cut of beef at home. You have to tell us how you make the BBQ style out west. As for the artichokes, I love them. What you see here is Hopes first experience of this veggie not in a dip. Needless to say, she loved them and are now on the approved list. We had them again for dinner tonight. Any suggestions for alternative preparations? Our artichoke prep is almost the same. We boil them whole in salted acidic water until almost done. We only half them ant clean out choke. Our marinade is usually Italian salad dressing. Easy, Peasy. Our motto with tr-tip at home is simpler is better. Salt, pepper and direct medium fire until 125 degrees. I reread your post and my only suggestion is pulling the tri-tip at 125. It will probably rise another 10 degrees while holding. We were watching 'Pittmasters" last night and all three judges agreed on 125 degrees. Two of the cookers said 135. The lower temperature will guarantee a medium rare. You risk a tougher meat at the higher temp. Thanks for the tips Chilebrown.